Where do American’s commute to work? An interactive map of county-to-county commutes. Testing the limits of Tableau can be quite fun, especially when you’re given free reign to use any data set. Yesterday I wanted to test map rendering capabilities between Tableau 7 and Tableau 8. Our mission at Facebook is to “make the world more open and connected” and I thought a great way to look at connectedness is through commuter flows. I built the map below, which contains 255K+ lines, using census data about American commuters (this is census data, not Facebook data). Tableau 8 is not noticeably faster than Tableau 7, even with the OpenGL graphics turned on. This is the case both on Desktop and Server. There’s a bug in 8 that is prohibiting worksheets from dynamically sizing within a container. The basically kills the ability to show/hide viz types dynamically using containers and parameters. Workplace information is crucial for understanding the degree of interconnectedness among our nation’s communities. Commuting plays an important role in the larger interchange of people, goods, services, and information across places, and helps shape the contours of metropolitan and micropolitan statistical areas. The Census Bureau produces county and MCD-level commuting flow tables every five years, using non-overlapping 5-year ACS estimates beginning with 2006-2010. To give you an idea for how I am using this, consider this question: Where do people travel from that want to come to the Silicon Valley (San Mateo County, CA)? Filter the Workplace State to California. This will reduce the Workplace County list to only counties in CA. Filter the Workplace County to San Mateo. From this, I wanted to only see where a large number of commuters were coming from, i.e., the most frequent commuters to Silicon Valley. I filtered out the Average Commuters of 1-100 and 101-500. This is interesting. As I would expect, there are a lot of commuters from the closest counties. However, there’s a significant number of people that commute from LA. Fascinating. Switch to the Dots view if you don’t want to see the lines. Another nice looking viz is: Residence State = Georgia with 501 average commuters and higher. There are not loads of people traveling outside of Georgia, but then again, it has a lower population than CA (there’s a population bias in the data). Give it a try with where you live and work. Share an image of your findings. Note that this initial view is filtered to those residing in CA so that it will draw in a reasonable amount of time. Once it loads, check (All) for Residence State and see all commutes in the US. It’s pretty cool. This is great, I was planning to do something like this myself but hadn't gotten around to it. I added a few features to it. 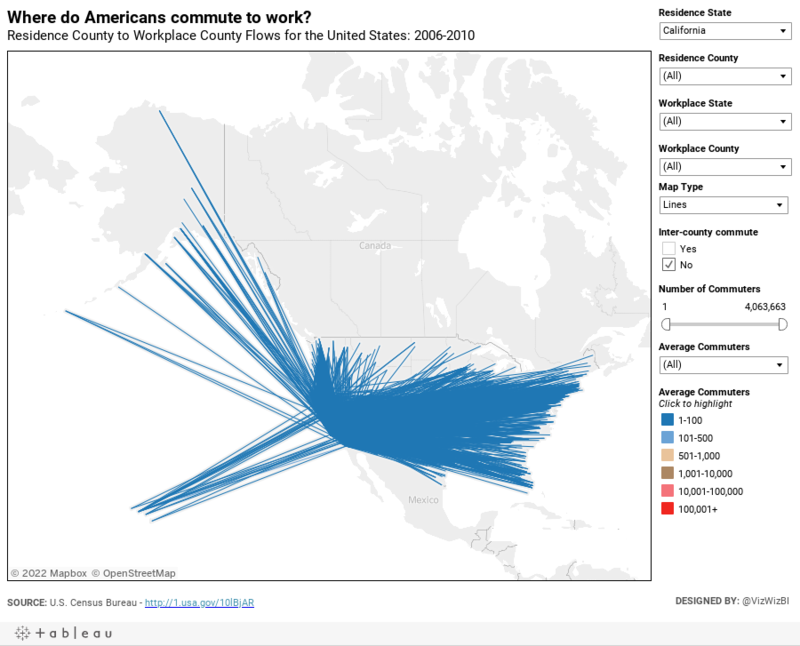 http://public.tableausoftware.com/views/commuteWork_v8/CommuteFlows (rough draft, right now it is counting everything twice), for my local region. If you add a switch in the SQL to mark the end and origin points you can make a nice directional line to indicate the direction of flow. I love the lines, but hate the pie charts. :-) Thanks for the cool redesign! I was afraid that the pie charts might cause some consternation. Economic development folks are especially interested in the amount of workforce supplied locally, hence the pies (and I started on 3-14), would you have a suggestion. The link to the workbook is dead. Would you mind re-uploading?